Elevating Products from one level to another this could be from floor to floor or within your production process taking your products from one machine to another. Belts can be used for a slight incline but if a steeper angle is needed it will need to have flights added as per the photo to the right. This also has an in feed hopper attached to the bottom of the system. Another type of belting is one with a grip faced finnish to help products from slipping back down. 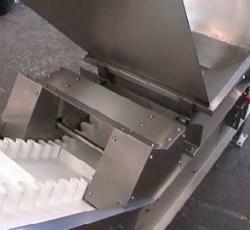 Elevators can also be used for food products using a plastic belt as per the photo below. This belting shows side cleats as well as flights to keep the loose products within the conveyors belt by restricting it.